Today we explored the local market, did some electronics shopping, and toured a local English Library. It was very informative and I feel as if I am getting a much better grasp on the situation in N’Djamena. To start I found out that I left a fire wire cable for the video camera back in the states. This happens to be the only way we can get the video off the camera (Also the reason you haven’t seen a video from us yet) and into the computer. Which is awesome to say the least. So we venture out into the city in search of a fire wire cable. Ashis arranged for one of his friends to help us locate the cable because apparently Best Buy hasn’t come to this market just yet and everything is spread out in specialty shops. His friends name is Ruben, who was born in Chad but raised in the US and returned about 6 years ago. While in the states he lived in the Midwest and graduated from a University in Wisconsin with a Degree in Business Management. 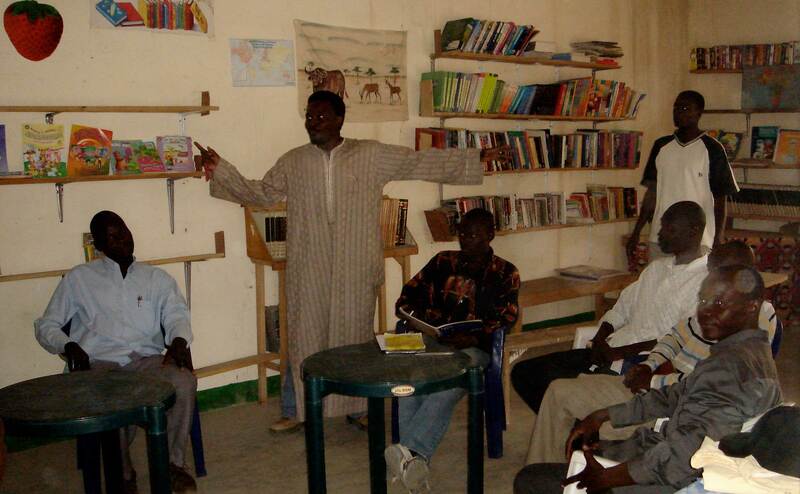 Since returning has created the first ever Chadian American library and also a community of Chadians who are managing the library. We had the chance to visit the library during one of the English classes in which they were teaching about 10 students. It was great speaking with them and hearing how impactful the program was in the area. At the library they also teach English classes, do service projects, and are cleaning up the community as an grassroots all Chadian organization. 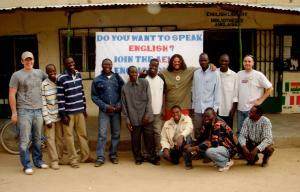 In doing so they are bringing education, knowledge, and a sense of pride to an area that is crying out for empowerment. In speaking with them you can sense the effects that are rippling through this community and how it is setting powerful example to other Chadians to do the same. It is exactly this type of grassroots action, drawing from and simultaneously empowering the local community that everyone of us can do anywhere. Ruben is a shining example how the power of one Global Citizen, being in service to others, creating value and inspiring those around them can change the world. It was great to discover and honor meeting Ruben and his community. Afterwards we made it to the market and stopped in 4-5 shops, only to find out that firewire cables doesn’t exist in Chad. So will have to rely on the hope that someone at the camps has one we can either borrow or share. However, I know that everything is working out perfectly and it will be great to see how this challenge is solved. Remember this is going out with people who know N’djamena not just the tourist spots. So for us it’s not all that different, but I keep wondering how do people here afford it? When you consider the average wage here is 20,000 CFA’s or about $40.00 and unemployment is running at over 70%. So doing the math something doesn’t work here So I asked Ashis, he said simply “They don’t, many people eat only once a day”. So the evening was spent talking about and trying to understand why the ruling regime would try and keep the people in poverty and destitution. My thinking was even if you want to take keep the people ignorant and in modern day slavery. Why not just do it like the United States? Just keep them afraid, constantly consuming to fill a void that is created through a quest for materialism that is fostered through a corporate controlled media. (For the record, I love America, believe it is still one of the greatest countries in the world. But I also think that those in power have lead us away from what made us great.) However, Ashis shared a story with us that in 1990 there was military coup. During this coup the rebel leader took over the country of Chad with 11 people, 11? Yes, 11 people. He executed the reigning President, drug him through streets and ate part of his body. Then the same thing happened to him only years later. This was very enlightening to say the least, and a great answer to my previous thinking. So the best we could come up with is when you rule as a military dictator in one of the five poorest countries in the world, keeping the people weak and afraid may be the best tools for from stopping them from revolting. Not very encouraging answers, but we really just created far more questions than solutions. Joshua, good luck locating your needed fire wire cable — what bad luck! We’ll have to patiently wait for some delayed video footage if you can’t find one to borrow. Until then, juat keep your posts filled with imagery and the kind of info you provided on the impressive library initiative, the insightful product cost comparison, and the historic account Ashis related to you. The additional questions you’re raising will be a challenge for us all in searching for solutions. Your journal’s have been so detailed,colorful and instructive that I have not even missed the video! No matter how difficult life can be,people love their countries!Please congradulate Ruben from all of us. A few questions come to mind:What is Chad’s main source of income?What is there population?How long ago were they a colony of France?And why did they agree to take in the refugees from Darfur? There ,where there is so little,you would think,attract,institutions,humanitarian agency’s,and also people with buisiness projects(maybe Best Buy is going a little to far) but from your report the political instability probably makes it risky.???????? Please be extra careful when you are touring the city,I am sure that you guys stand out like a sore thumb,and where there is so much need and instbility,there is also danger. First let me say thank you for your kind words, there is so much to say and express that you very quickly realize how ineffective words can be in communicating what you are experiencing. But its good ot hear that it some of it is coming through. What is Chad’s main source of income? Landlocked Chad’s economic development suffers from its geographic remoteness, drought, lack of infrastructure, and political turmoil. About 85% of the population depends on agriculture, including the herding of livestock. Of Africa’s Francophone countries, Chad benefited least from the 50% devaluation of their currencies in January 1994. Financial aid from the World Bank, the African Development Bank, and other sources is directed largely at the improvement of agriculture, especially livestock production. Because of lack of financing, the development of oil fields near Doba, originally due to finish in 2000, was delayed until 2003. How long ago were they a colony of France? There ,where there is so little,you would think,attract,institutions,humanitarian agency’s,and also people with business projects?